/ What to pack for Domopalooza 2016. 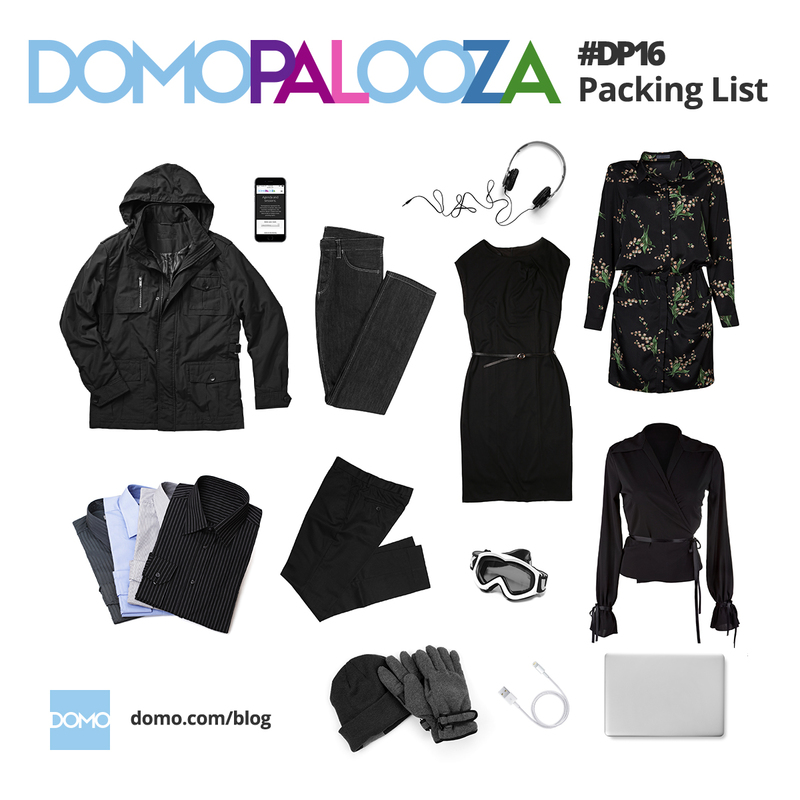 We’re less than two weeks away from Domopalooza. Maybe you’ve already started planning your trip, but chances are more than a few of you will be packing your suitcase the night before you leave (and if you’re really procrastinating and haven’t registered yet, there’s still time). Either way, these packing tips will help you get your packing sorted out so it’ll be nothing but smooth sailing once you get to Salt Lake City. As a tech user conference, Domopaloooza is guaranteed to be pretty plugged-in. Bring your laptop for hands-on sessions, and make sure you pack charge cords for all your mobile devices (and don’t forget your mobile devices either). Following us on social media will keep you connected to everything that’s going on, and there’s a Domopalooza app like last year. You can find it in the Apple App Store and Google Play on your mobile device, or hit us up at @domotalk and we’ll send you a link. If you’re taking advantage of those two free ski days at Snowbird, get excited—you’re visiting during the best time of year for hitting the slopes. Spring skiing in Utah is typically pretty balmy with blue bird skies and lots of fresh powder, but March is known to host a blizzard or two (hence the powder). The key to staying warm on the slopes is layering. Pack plenty of wicking base layers, a light mid-layer, waterproof jacket and pants, insulated gloves, a warm hat, and a good pair of goggles. No need to bring your skis or board, though. Rentals are covered with your Domopalooza pass. For more tips on how to prep for and what to expect at Domopalooza 2016, check out our Domopalooza survival guide, and we’ll see you March 21st.